I have busy first looking for one and then moving houses for the last few weeks now. It is such a tiring process. But I had a lot of fun looking for new furniture, Nonetheless we finally moved in our new house this weekend and I wanted to make up for all wall of silence on my blog. 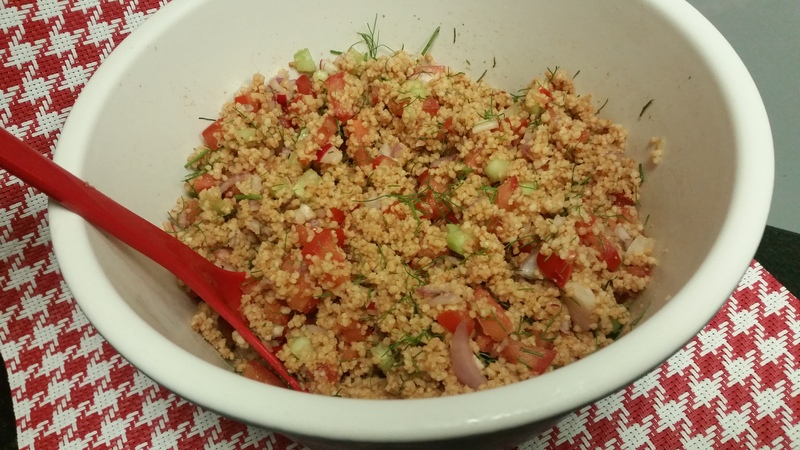 So here I am, back to the Middle Eastern spread on the blog, sharing an easy recipe for the couscous salad. This is a new favorite and an easy lunch box recipe. It gets ready quickly on weekday mornings. You can chop up the veggies while the couscous is resting. 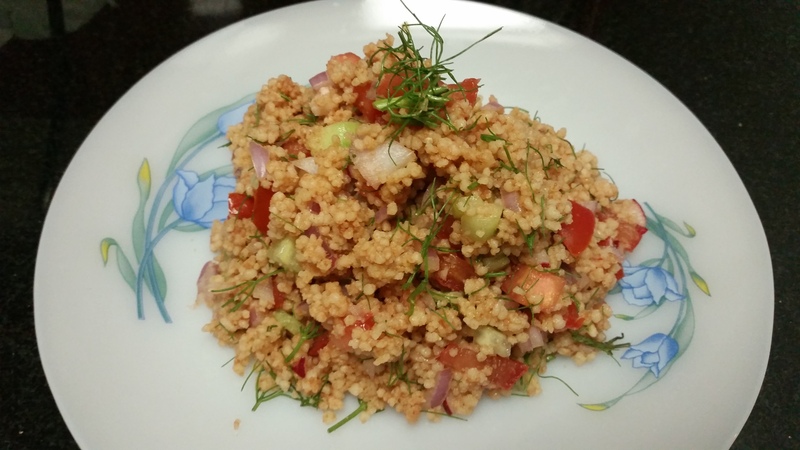 Couscous is a healthy protein rich option and also low on calories. 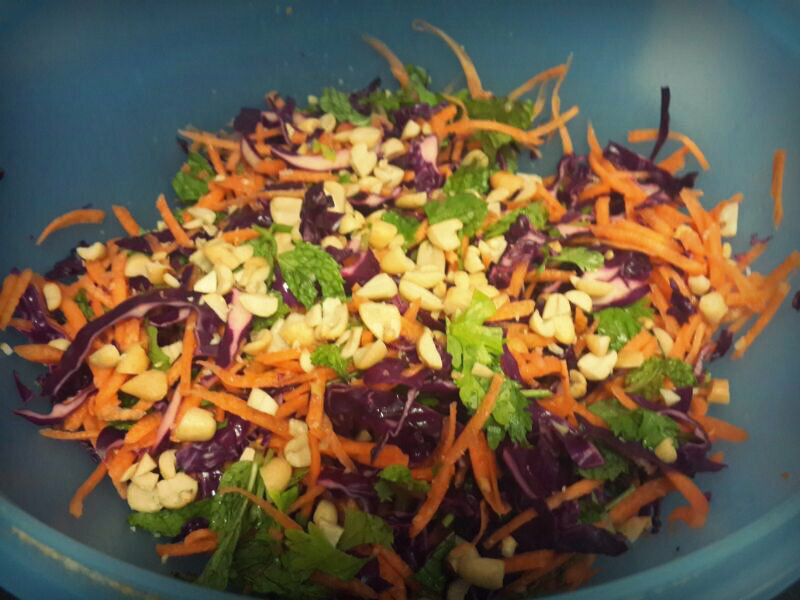 Add any veggies you love to eat on a given day and you have colorful lunch box which you co-workers would like to dig in. In a wide bowl, pour boiling water over couscous and cover it with a lid for 10 minutes. 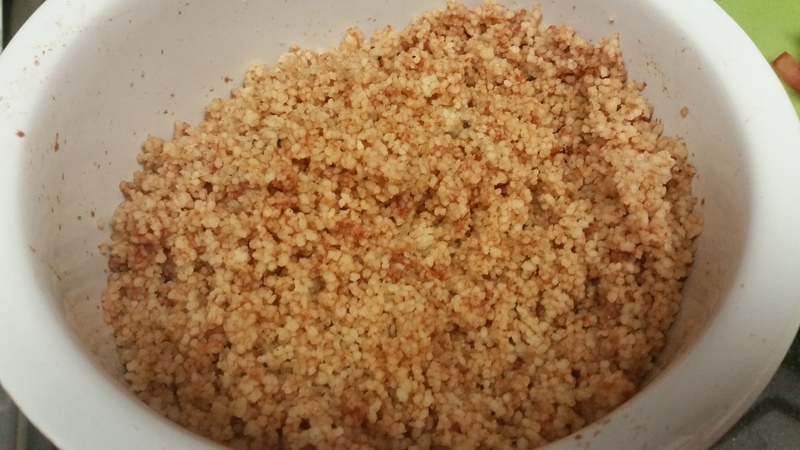 Let the couscous absorb all the water. 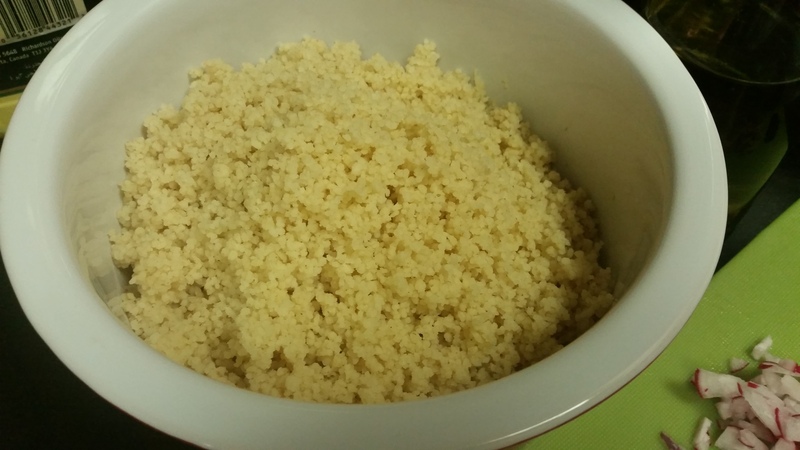 After uncovering the lid, when all water is absorbed, use a fork to fluff the couscous and let it cool for a while. You could also use vegetable stock to add flavors. Add the tomato paste and with hands rub the paste in to the couscous. Add all veggies. Dress the salad with olive oil, salt, black pepper and dill leaves. Toss them well and let it refrigerate for a bit. Savour this on a hot summery afternoon! Off late I have taken a liking to eating carrots with a side of hummus or zataar labneh. It’s my usual go-to snack at work as well. I have always liked eating the red carrots I find back home. When I first came to Dubai, finding red carrots also referred as Pakistani carrots became a rarity. I took my own sweet time liking the orange-tinged New Zealand or Australian carrots but now I use them in mostly everything. I put diced carrot in tomato soup (it lends a beautiful color and adds an undertone of sweetness to the acidity of the tomatoes) in savoury snacks like Poha, Upma or just carrots in salads. Orange carrots are a good source of beta carotene and Vitamin A. Long hours spent glaring at the computer screens have left my eyes looking tired so I munch on these apart from investing in an eye cream. I have family come over often for weekend lunch. My brother in law likes experimenting with salads and his favorite is the sprouts salad I make. However this time around he asked me to make something different. I instantly remembered a bookmarked recipe from BBC Good Food’s website. 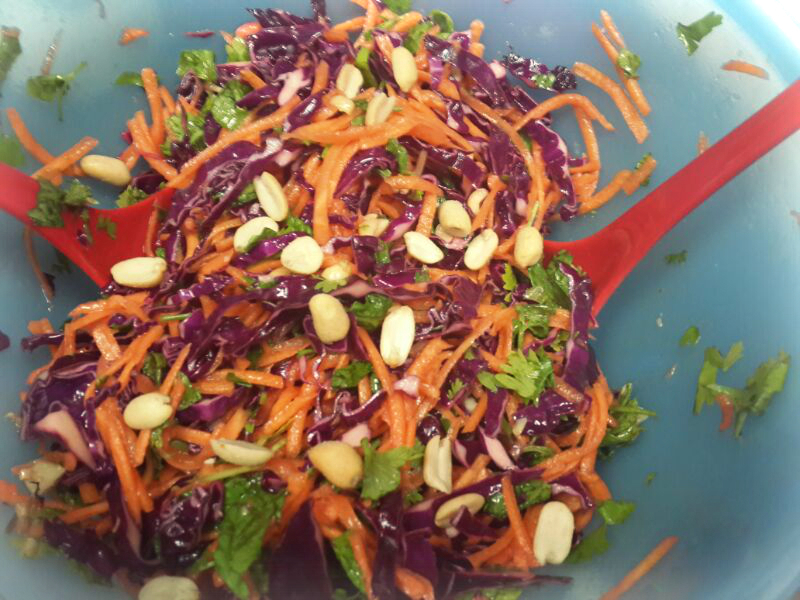 I had red cabbage in the fridge and decided to make this Red Cabbage and Carrot Salad. It’s an adapted version. Toss all the veggies in a salad bowl. I have added more of the peanuts since we like a bit more crunch in the salad. I have used a pack of pre-toasted and salted peanuts which you easily get in Indian supermarkets. 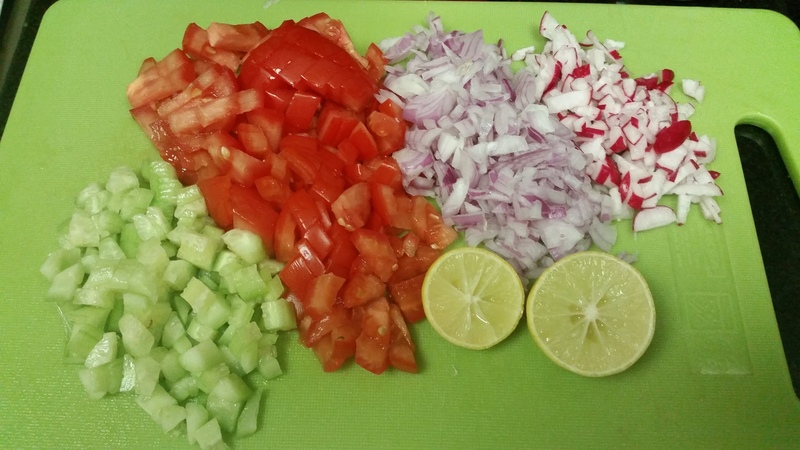 In a small bowl mix the ingredients for the dressing and blend them well. Add the chopped herbs and pour the dressing over it. Add the toasted peanuts and serve immediately or chill for 10 minutes. I hope you like this recipe as much as my family did.